SUN HAVEN: Baypointe/Hamiltons Reserve, Kissimmee. 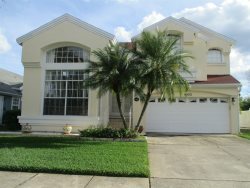 4 Bedrooms 2.5 Bath Private Pool Home located in the heart of Kissimmee's Hwy 192 area. Large home value priced for our budget minded vacationers. This home has a fantastic large sunny pool area. All bedrooms are located upstairs. With ample living space on the first level, this home is designed to bring families together during their holiday. There are no televisions in the bedrooms to distact famlies from spending time together. The home's only television is located in the family room which is just off the kitchen with direct access to the spacious pool deck. Unplug from all of your distractions and enjoy bringing the group together in our lovely Sun Haven.